Major General (Ret.) 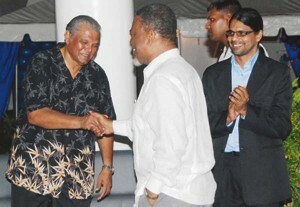 Joe Singh, a great contributor to Guyana, celebrated his 70th birthday, yesterday. Maj General Singh over the years has been recognized for his stewardship and contribution to both the private and public sectors in Guyana. He was known to have served in quite a few prestigious positions. Major General (Rtd), Joe Singh, during his retirement reception at the Arthur Chung Convention Center. From left is Singh, Sam Hinds and Yog Mahadeo. In 1986, he was appointed Head of the Guyana Defence Force by former President, the Late Desmond Hoyte, replacing the now President of Guyana, David Granger. Since his appointment as Chief as Staff of GDF, Singh served this nation under five Presidents of Guyana before retiring. But before that he was a student of Queen’s College who pursued studies at some of the prestigious military schools in the developed world. As a paratrooper, Maj. Gen made some 60 jumps before he sustained and injury that cut short his stint as an active paratrooper. Some would remember that Lieutenant Joseph Singh led the takeover of the Bartica Police Station after the police had arrested some of his men for some transgression in the community. The late Forbes Burnham, who was Prime Minister at the time, made Maj Gen Singh and his platoon walk from Bartica to Georgetown through the Rockstone trail. Maj Gen Singh served as Chairman of the Guyana Elections Commission, for the 2001 elections and following the elections he retired. He went on to serve as the Chief Executive Officer of the Guyana Telephone and Telegraph Company but retired in July 2010. Just over two months later he was forced back to that post because his replacement had tendered his resignation. Former Prime Minister, Sam Hinds, had lauded the outstanding service rendered to the country by Singh, in his numerous capacities. “You managed to ensure that things remain relatively calm during a period of unrest…,” Hinds said in his toast, referring to unrest in the streets of the capital city following the 1992 elections. Singh was in charge of the army at the time. Singh’s character and discipline, also acknowledged his concern for the protection of the environment and his commitment to its preservation and orderly development. This led to him supporting initiatives by government, including the Low Carbon Development Strategy. Mr. Singh also served as the Executive Director of Conservation International-Guyana for a number of years and in 2012 served briefly as the Chairman of the Guyana Geology and Mines Commission. His retirement came after concerns were raised by miners who threatened to boycott GGMC activities. Having great knowledge of the interior and hinterland districts, the Retired Major was able to preserve the Wai-Wai heritage as he was said to have been the only person they trusted to converse with.